FILE - Attorney General Jeff Sessions accompanied by Deputy Attorney General Rod Rosenstein, left, speaks at a news conference. United States Attorney General Jeff Sessions has resigned. The resignation brings to an end a difficult relationship between the two men. Trump strongly criticized Sessions’ decision to step aside from the investigation into Russian interference in the 2016 presidential election. Sessions did so after it was reported that he met with Russian officials before the election. Sessions had also served on Trump’s election campaign team. Sessions’ admission angered Trump who said he never would have nominated the former Alabama senator if he knew he would have stepped aside. Sessions decided to step aside in March of 2017 and left Deputy Attorney General Rod Rosenstein in charge of the investigation. Rosenstein then appointed special counsel Robert Mueller who has investigated a wide number of possible crimes including failure to pay taxes and lying to investigators. What will happen to Mueller investigation? 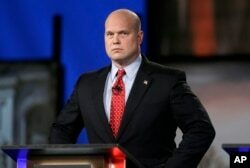 Whitaker once discussed a situation in which Trump could fire Sessions and then appoint an acting attorney general. The appointee could then reduce funding for Mueller’s investigation. Several Republican Party lawmakers had warned Trump not to dismiss Sessions. However, support for the attorney general seemed to decrease over this year. Sessions served for 20 years in the U.S. Senate before taking the office of the nation’s top law enforcement official. Mario Ritter adapted it for VOA Learning English based on AP and additional reports. Hai Do was the editor. We want to hear from you. Write to us in the Comments section, and visit our Facebook page. How Much Independence Will Special Counsel Have?